Street DJing Festival ! 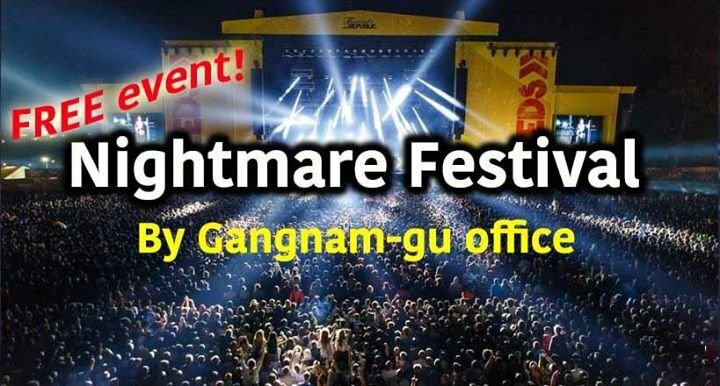 Free Korean EDM Festival -Halloween ver. FREE EDM Festival with 3000 Korean people ! 3천명이 함께하는 무료 EDM 페스티벌 ! Gangnam-gu office installed a huge stage in Rodeo street with hundreds of food booths. Come dance with 3000 Korean people for FREE !! 3000 Korean zombies are coming ! Come in Costume and enjoy Korean EDM festival. Gangnam-gu office shows how Koreans enjoy Halloween ! Free festival on the Rodeo street and FREE after party at 2 clubs in Gangnam for the participants ! The ones who came to the Rodeo Nightmare Festival can get into those clubs for free afterwards ! When ? 17:00-02:00 on the 29th Saturday October.